So I stumbled across this article the other day, Being a Stay-at-Home Parent Is a Luxury … for Your Spouse. I swear, I am really not trying to wade into any of the mommy wars. But the article made me think about my previous experience at a law firm. My firm had over 400 attorneys in its DC office. At the associate level, the ranks are pretty evenly split between men and women. For partners, however, less than half are women. Maybe around 1/4? 1/3? Like I said, I’m guesstimating, but–as at most firms–fewer women partners. 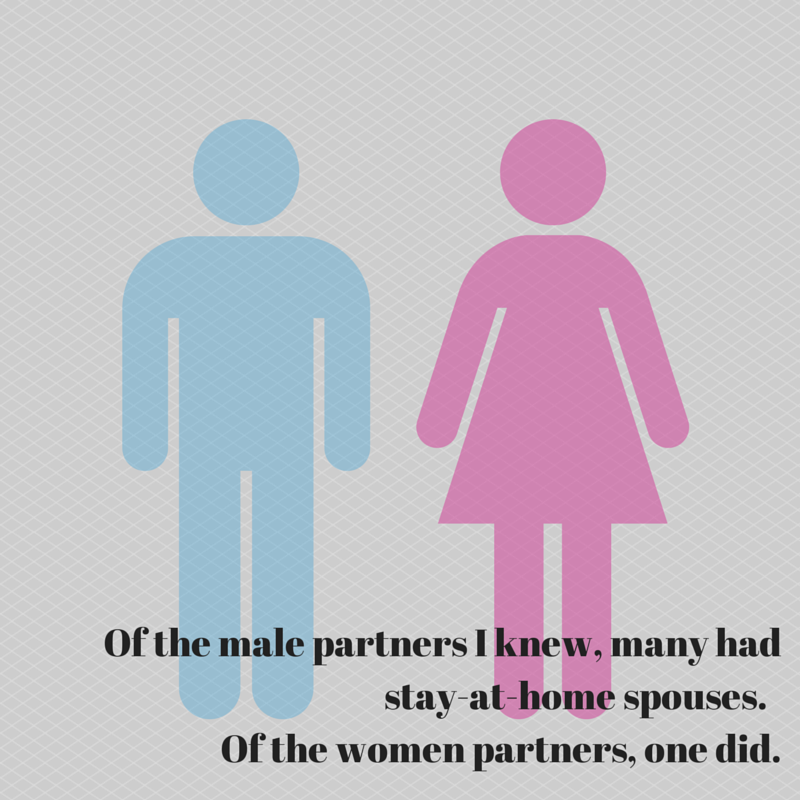 Of the male partners I knew, many had stay-at-home spouses. Of the women partners, one did. Law firm life can be very flexible, but it is certainly demanding. It really helps not to have to worry about leaving at a certain time to pick up the kids or rescheduling a conference call to take someone to the doctor’s. As the author notes, having someone at home certainly makes travel and staying late easier. And you can be more productive when you can outsource all those nagging tasks like remembering to buy more band-aids, picking up a present for the birthday party on Saturday, and waiting for the internet repair peeps to show up. It is possible to have these benefits with a working spouse, but you have to hire help. Which means finding good help and then managing someone. It’s not impossible, but it adds layers. Many lawyers with big careers are drawn to coupling with other people with big careers which can mean less wiggle room and time to manage people. In sum, my generalization is that, in my experience, more male partners than female partners had situations where they had less to manage on the domestic front. Law firms reward those who can fully commit to the office. Having someone else do things at home makes that commitment easier. Now again–I am not trying to anger you, oh internet–I’m in no way saying any of these things are better than any others. This is just my observation on the way it played out at the firm. Hope about you, hopefully unangered reader? Would you benefit from a stay-at-home spouse? Have you noticed any differences for those with a stay-at-home spouse? I’m not angered. But I definitely get the claim that it’s easier to have a stay at home spouse. With no kids, you might think I wouldn’t complain, but the truth is that I depend quite a bit on Jeff’s more flexible schedule. I hear ya. Even pre-kids, I depended a lot of James’s more flexible schedule as well.